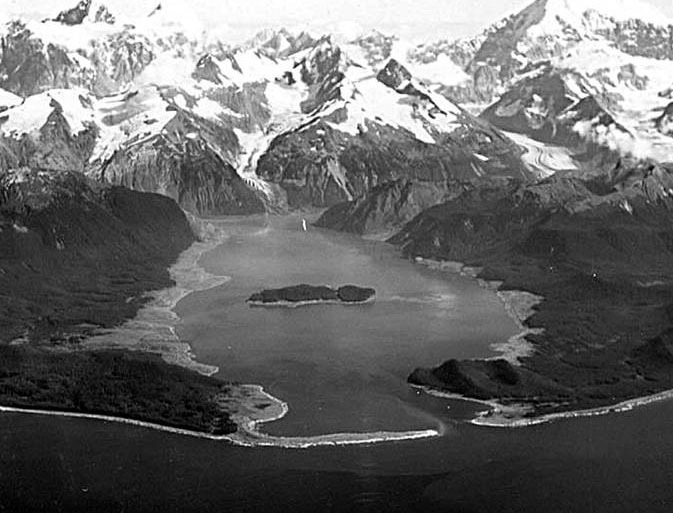 9 July 1958, an unusually severe disaster occurred in the Gulf Lituya in Southeast Alaska. There was a strong earthquake on the fault, Farwater that caused the destruction of buildings, the collapse of the coast, the formation of numerous cracks. And a huge landslide on the hillside above the Bay sparked a record height of 524 m, which at a speed of 160 km/h swept through the narrow, fjord-like Bay. “After the first shock I fell out of bed and looked in the direction of start Bay, from where came the noise. Mountains terribly shaking, rocks and avalanches swept down. And was particularly struck by the glacier in the North, it is called glacier Lituya. Usually it’s not visible from where I was anchored. People shake their heads when I tell them that I saw him that night. I can’t help it if they don’t believe me. I know glacier is not visible from the place where I was anchored in the Bay anchorage, but I also know that you saw him that night. Glacier rose into the air and moved forward so that became visible. He must have climbed several hundred feet. I’m not saying that he was just hanging in the air. But he was shaking and jumping like crazy. Large chunks of ice fell from its surface into the water. The glacier is located six miles from me, and I saw large pieces that had fallen from him like a huge truck. This went on for some time — it’s hard to say how long — and then suddenly the glacier disappeared from view and above it rose a great wall of water. The wave went in our direction, and then I was too busy to tell what else happened there”. Lituya is a fjord located on the fault, Farwater in the North-Eastern part of the Gulf of Alaska. 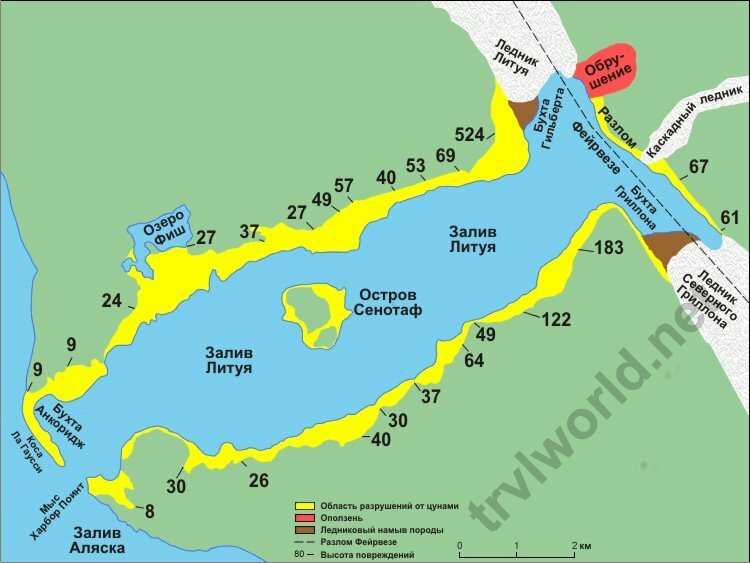 This is a T-shaped Bay with a length of 14 kilometers and three kilometers in width. 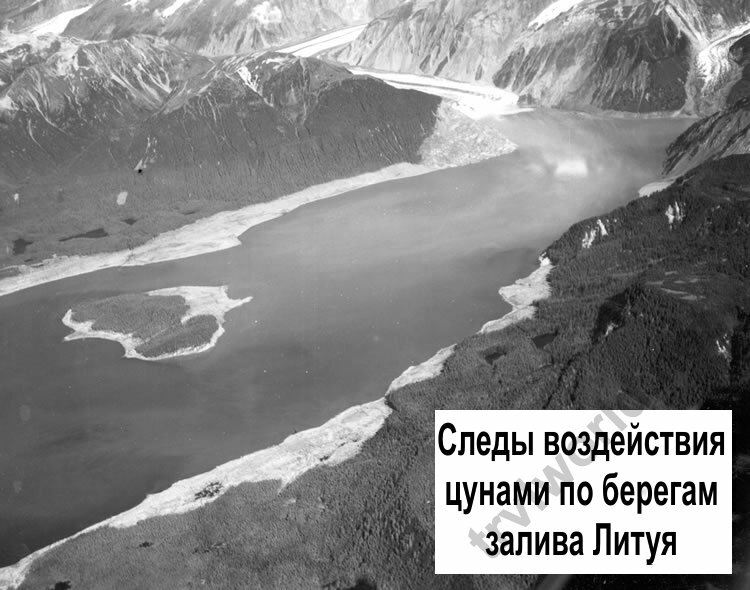 Maximum depth is 220 m. the Narrow entrance to the Bay has a depth of only 10 m. In the Bay Lituya down two glaciers, each of which has a length of about 19 km and a width of up to 1.6 km preceding the events described in Lituya century have repeatedly observed wave height of more than 50 meters: in 1854, 1899 and 1936. 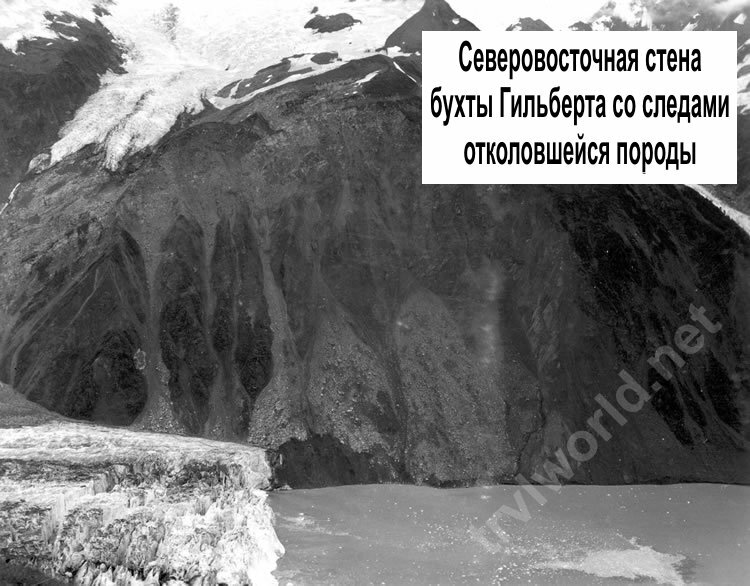 The 1958 earthquake caused a subaerial rock fall at the mouth of the Gilbert glacier Bay Lituya. As a result of this landslide of more than 30 million cubic meters of rock collapsed into the Bay and resulted in a megatsunami. From this accident, 5 people were killed: three on the island Hantak and two more were washed away in the Gulf. In Yakutat, the only permanent settlement near the epicenter, had been damaged infrastructure: bridges, docks and pipelines. 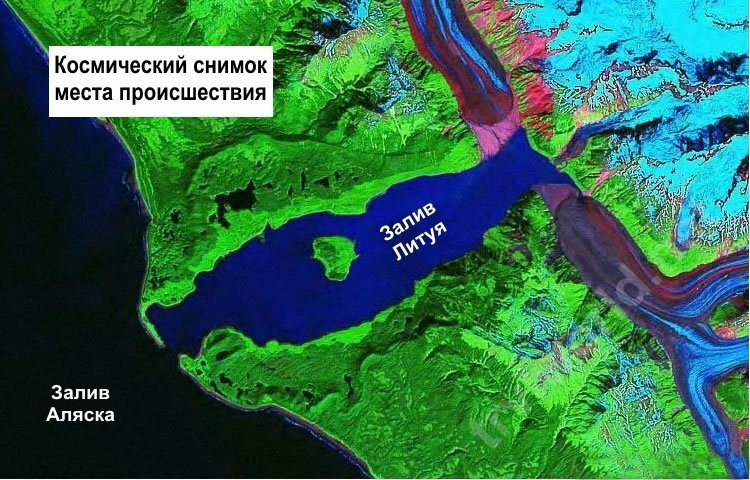 After the earthquake, a study was conducted subglacial lake, located Northwest of the bend of the glacier Lituya at the beginning of the Bay. It turned out that the lake was down 30 meters. This fact was the basis for another hypothesis of the formation of giant waves with a height of over 500 metres. Probably during a descent of a glacier a large volume of water into the Bay through the ice tunnel under the glacier. However, the flow of water from the lake could be the main reason for the occurrence of mega-tsunami. 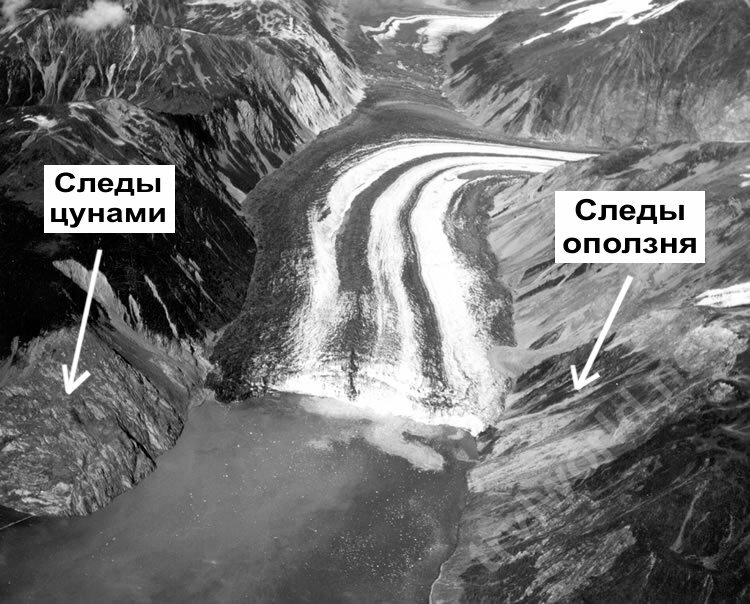 Huge mass of ice, stones and earth (volume of about 300 million cubic meters) from the glacier rushed down, Stripping the mountain slopes. The earthquake destroyed many buildings in the land cracks, slipped coast. Moving mass struck the Northern part of the Bay, flunked her, and then crawled to the opposite side of the mountain, Stripping his forest cover to a height of more than three hundred meters. 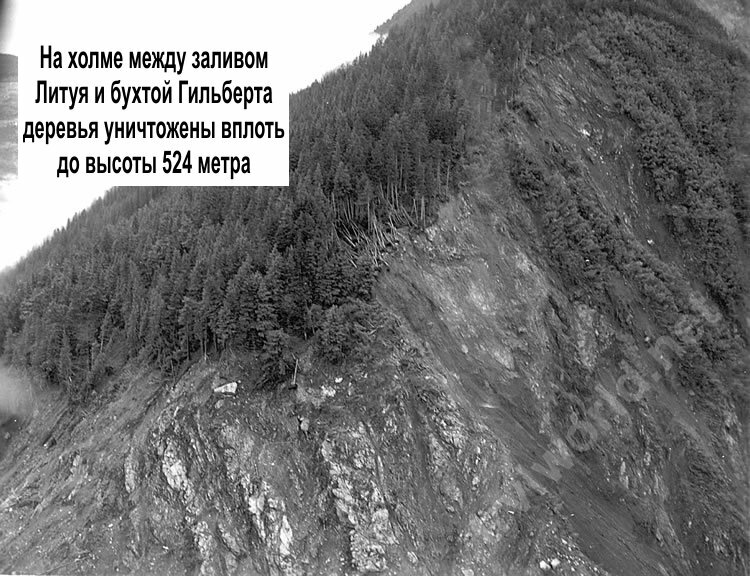 The landslide generated a giant wave which literally brought the Bay Lituya towards the ocean. The wave was so big that it would cross entirely through the shoal at the mouth of the Bay. Witnesses of the disaster were the people who were on Board the ships, which dropped anchor in the Bay. From a violent shock all of them were thrown from beds. Springing to his feet, they could not believe their eyes: the sea got up. “Giant landslides, raising clouds of dust and snow in its path and started running along the slopes of the mountains. Soon their attention was attracted by an absolutely fantastic sight: a mass of ice of the glacier Lituya far to the North and is usually hidden from the eyes of the peak, which stands at the entrance to the Bay, as it rose above the mountains and then majestically descended into the waters of the inner Bay. It all seemed like a nightmare. In the eyes of the shocked people up rose a huge wave that engulfed the Northern foot of the mountain. After that, she swept across the Bay, tearing trees from the slopes of the mountains hit the water the mountain on the island of Cenotaphe… rolled over the highest point of the island, rises to 50 meters above the sea level. All this weight was suddenly thrown into the water close Bay, causing a huge wave, the height of which apparently reached 17-35 m. Her energy was so great that the wave furiously ran around the Bay, overflowing the slopes of the mountains. In the inner pool, the shock waves on the shore, probably was very strong. The Northern slopes of the mountains facing the Bay, stripped: where once was a dense forest, was now bare rock while this was at the height of 600 metres. One boat is lifted up, moved easily through the shallows and dropped into the ocean. In that moment, when the boat shifted through the beach are the fishermen saw beneath the trees. Wave literally tossed people through the island into the open sea. During the nightmarish jumps on the giant wave the boat was shaking on the trees and debris. The boat sank, but the fishermen just miraculously survived and after two hours were saved. Of the other two launches one successfully withstood the wave, but the other sunk, and who was on it people have gone missing. Mr. Howard George. Ulrich on his yacht, called “EDRI”, entered the waters of the Gulf of Lituya about eight in the evening and anchored on a nine-meter depth in a small Cove on the South shore. Howard says that suddenly the boat started to wobble. He ran on deck and saw in the North-Eastern part of the Gulf rock was moved because of the earthquake and the water started to drop a huge block of rock. After about two and a half minutes after the earthquake, he heard the deafening sound from breaking rock. Ulrich said that he watched the whole process of development of the waves, which reached their yachts in a very short time — about two and a half or three minutes since then, as it was first noticed. “Because we didn’t want to lose the anchor, we are fully etched anchor chain (about 72 meters) and started the engine. Halfway between the North-Eastern edge of the Bay and the island of Lituya Cenotaph you can see the wall of water a hundred feet height, which stretched from one coast to the other. When the wave approached the Northern part of the island, it was divided into two parts, but through the southern part of the island, the wave has again become a single entity. It was smooth, only the top was a small comb. When this mountain water came up to our boat, its the front was fairly steep, and its height was from 15 to 20 meters. Before the wave came to the place where our boat, we did not feel any lowering of water or other changes, except for the slight vibration that was transmitted through the water from the tectonic processes that began to operate during the earthquake. As soon as the tide came up to us and started to raise our family boat, the anchor chain was badly cracked. The boat was carried towards the southern coast and then, at reverse motion of the wave, towards the middle of the Bay. The top of the wave was not very wide, from 7 to 15 meters, and rear the front was less steep than the front. After 25-30 minutes, the surface of the Gulf calmed down. Near the coast you could see a lot of logs, branches and uprooted trees. All this stuff slowly drifted towards the center of the Bay and Lituya to its mouth. In fact, during the entire incident, Ulrich has not lost control of the boat. When at 11 PM “EDRI” came to the entrance to the Bay, it was possible to observe the normal current, which is usually caused by the daily tide of ocean water. 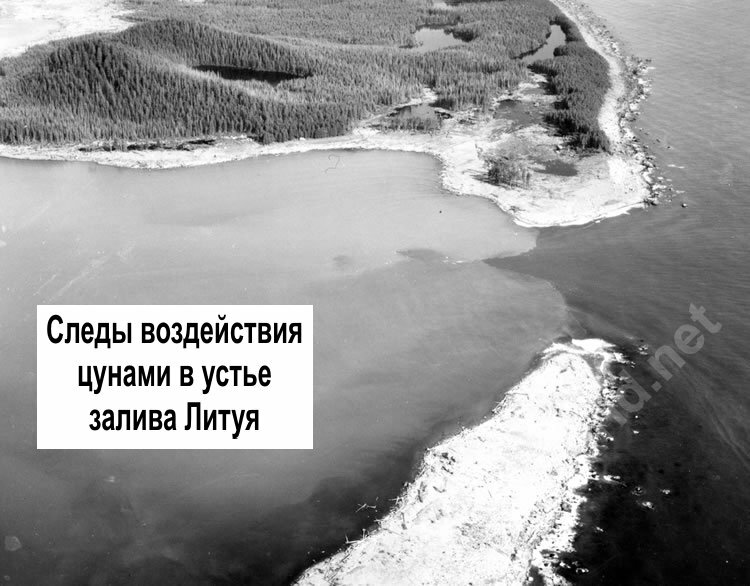 Other witnesses of the disaster, the couple Swanson on the boat called “Badger”, and entered the Bay Lituya about nine in the evening. First, their ship came to the island Cenotaph and then returned to the Bay anchorage on the North shore of the Bay near its mouth (see map). Swenson anchored at a depth of about seven meters and went to sleep. Sleep William Swenson was interrupted due to the strong vibration of the hull. He ran to the control cabin and started clocking what is happening. A little over a minute from the moment when William first felt the vibration, and probably before the end of the earthquake, he looked in the direction of the North-Eastern part of the Bay, which was visible in the background of the island Cenotaph. The traveler saw something that he took first for the glacier Lituya that rose into the air and began to move towards the observer. “It seemed that this mass of solid, but she jumped and swayed. Before this lump in the water constantly falling large pieces of ice.” After a short time, “the glacier disappeared from view, and instead, in that place came a big wave and went in the direction of braids La Hausse, just there, where they anchored our boat”. In addition, Swenson drew attention to the fact that the wave flooded the shore for a very noticeable height. When the wave passed the island Cenotaph, its height was about 15 feet to the center of the Bay and decreased gradually near the coast. She held the island in about two and a half minutes after it was first noticed, and reached the yacht “Badger” after eleven and a half minutes (approximately). Before the arrival of the wave William and Howard Ulrich, have not noticed any lowering of the water level or some turbulent events. Yacht “Badger”, which was still anchored, lifted by a wave and carried in the direction of braids La Hausse. The stern of the yacht when it was below the crest of the wave, so that the position of the vessel resembled a surfboard. Swenson looked at this moment on the place where they were to be seen trees growing on the spit La Hausse. At the moment they were hidden by water. William said that over the tops of the trees there was a layer of water equal to about two lengths of his yacht, of about 25 meters. After the braid La Hausse, the wave very quickly went into decline. In the place where there was a yacht Swenson, the water level began to drop, and the ship hit the bottom of the Bay, staying afloat near the shore. 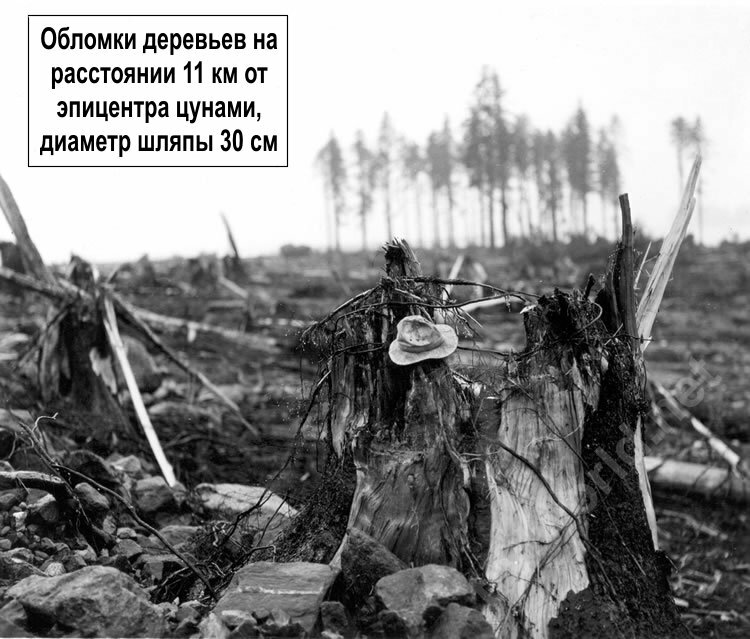 3-4 minutes after hitting Swanson saw that the water continues to flow over oblique La Hausse, carrying logs and other debris of forest vegetation. He wasn’t sure that it wasn’t the second wave, which could move the boat across the spit to the Gulf of Alaska. Therefore, spouses Swanson left his boat, after moving to the small boat, with which they were picked up by a fishing boat a few hours later. During the incident in the Gulf Lituya was the third vessel. It was anchored at the entrance to the Bay and was sunk by a huge wave. None of those on Board survived, the victims, presumably two. What occurred on 9 July 1958? That night a huge rock fell into the water with a steep cliff towering over the North-Eastern shore of the Bay of Hilbert. The area of collapse are marked on the map in red. Blow enormous mass of stones with a very great height caused an unprecedented tsunami that wiped off the face of the earth all living things that were all over the shores of the Bay Lituya up to spit La Hausse. After the passage of the waves on both shores of the Bay was left not only vegetation, but even the soil on the surface of the shore was bare rock. The damage area shown on the map in yellow. The numbers along the shore of the Bay mark the height above sea level edge of the damaged land area and roughly corresponds to the height of the last wave here.